← Get a FREE Chamilia Bracelet! It’s once again, Watch Wednesday! Today we will be talking about how to properly clean and care for your watch. Watches need the same amount of attention as fine jewelry. Fine watches are sophisticated and precise pieces of equipment; the price often reflects the skilled workmanship that goes into a fine timepiece. In order to get the most satisfaction out of your watch, you should follow some simple care and cleaning guidelines. No matter how handy you are, don’t attempt “do-it-yourself” watch repairs. Only an expert jeweler/watchmaker should be trusted to put your watch back into working condition. Give your watch a quick check on a regular basis; making sure that the strap or bracelet is securely attached to the watch face. A mechanical watch should be checked regularly by your jeweler/watchmaker or an authorized dealer and serviced according to the manufacturer’s guidelines. Wind your watch in a clockwise direction, preferably about the same time each day. Remove the watch from your wrist when winding so as not to place undue pressure on the stem. Replace broken or scratched crystals immediately. Even a hairline crack can let dust and moisture into the time-keeping mechanism, threatening its accuracy. Unless the degree of water-resistance is clearly specified when you purchase your watch, do not wear it into the shower or pool, or on a moist wrist. Have your jeweler/watchmaker or an authorized watch dealer replace the battery in a quartz watch before it runs out. Dead batteries left in the watch can leak or corrode, ruining the timepiece. Do not attempt to change the battery in a watch yourself. If your watch is water-resistant, a water-resistance test should be performed after the battery has been replaced to ensure that water will not leak into and damage the watch. Oils from your skin can build up on a watch. If your watch is water-resistant, you can give it a quick cleaning with a mixture of warm water and either a mild soap or a dish detergent. Dry the watch with a soft cloth after cleaning. If your watch has a strap made out of leather or another material, you should clean only the watch face and not the strap. If your watch is not water-resistant, or you’re not sure, do not immerse it in water. Clean the piece with a slightly damp cloth and then dry. 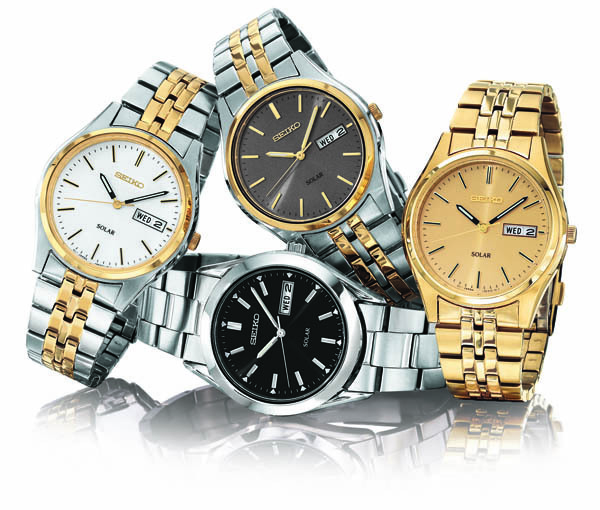 See our large collection of watches by Seiko, Pulsar, Citizen and Fossil! This entry was posted in Watches and tagged jewelry warehouse, watch, watch wednesday, watches. Bookmark the permalink.